The visible universe is made up of atoms that can produce and absorb light. This is called “normal” matter. When astronomers compare the amount of normal matter that was present when the universe was young, they find a problem: about half of the matter has gone missing. Astronomers suspect that the missing matter has eluded their telescopes because it is very hot, so hot that it makes X-rays. It has been suggested that the missing matter is in hot halos of gas surrounding galaxies, including our own Milky Way galaxy. 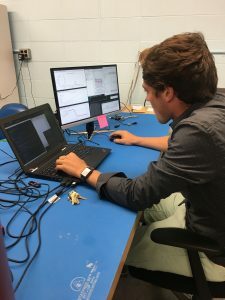 HaloSat will be the first CubeSat funded by NASA built to do astronomical observations of objects beyond our solar system. HaloSat is being built now and is scheduled to launch in 2018. This satellite will measure X-rays from hot gas surrounding the Milky Way and address the question: Is there a massive, extended, hot halo around the Milky Way?